It’s not green season until you’ve devoured a green chile cheeseburger. The New Mexico Tourism Department curates a collection of the state’s best, including the famous burger at Sparky’s in Hatch, Laguna Burger west of Albuquerque, and the green chile meat bomb served at Buckhorn Tavern in the tiny town of San Antonio. The largest collection of chile growers in Santa Fe congregates at the Railyard Pavilion each Tuesday and Saturday morning. The preferred pepper variety: the non­hybridized chile “landraces,” which are common to valleys of the north. Each chile has a slightly different flavor and heat profile. Taste a bunch to find your fave. Green chiles arrive in the big city by the truckload, and when they do, locals know to line up at their favorite farmstand. The Rosales clan of Lemitar sets up on North Fourth Street and on Isleta Boulevard Southwest. 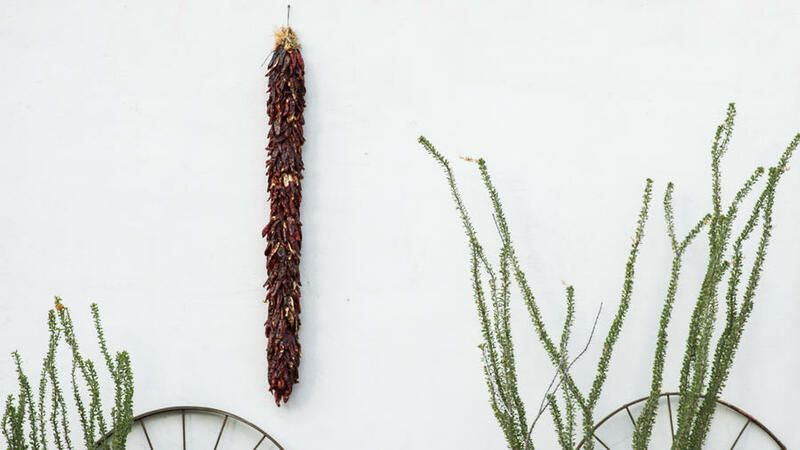 Across the Rio Grande in Corrales, the Wagner family offers chiles along with an entire farmland experience, replete with a corn maze and hayrides. Every Labor Day weekend, this tiny farming town turns into Chile USA. Sure, there’s a parade, plus mariachi bands, ristra-making workshops, and chile-eating contests. But really you’re here to buy peppers hours after they’ve been picked. The world’s only organization devoted to the research of chiles welcomes visitors. The seed store stocks new strains of super-hot peppers, and this month in the Teaching Garden, you can watch more than 150 chile varieties ripening from green to red and every color in between.